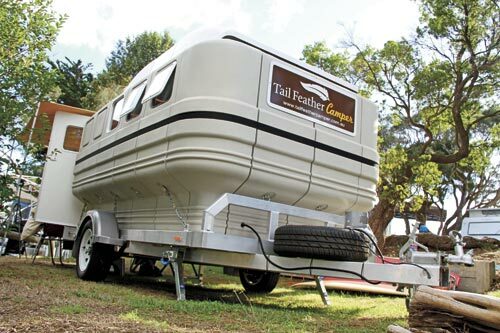 The Tail Feather is a brand new product brought out to Australia in flat packs and assembled as desired. 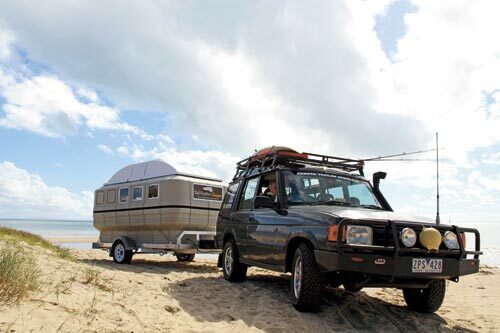 It is marketed to the rough and tough offroad fraternity. 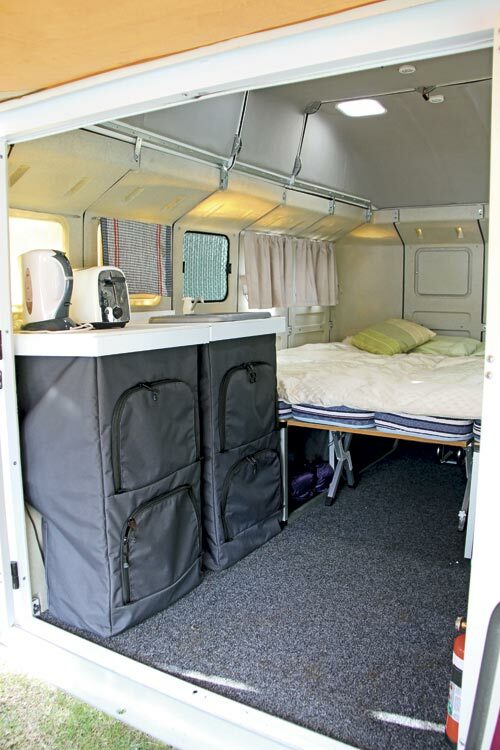 Its lightweight and simplistic design lends itself to those with smaller commuter vehicles, weighing in at 500kg tare all up. 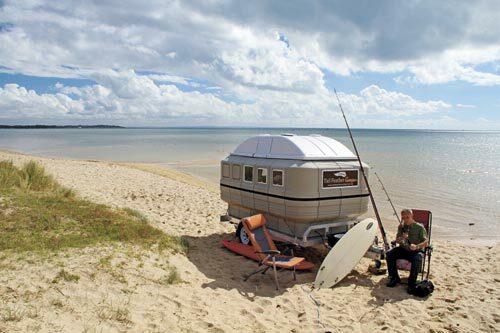 The optional single-axle aluminium trailer is extremely well made. It has basic override brakes and a hand brake is fitted as standard even though both are not legally required in most applications. It has 14in conventional tyres with Sunraysia powder-coated steel wheels. The configuration can be upgraded to full offroad suspension at the customer’s request. 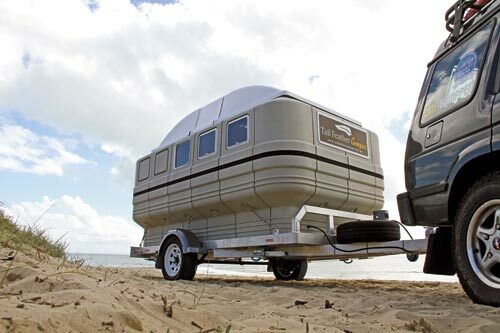 The trailer body is basically a flat tray, and there’s an option to have detachable drop-down sides as well. The drawbar of the prototype has a gas bottle and spare wheel mount, however Micky and I discussed that most people would opt up to a tool box and battery container. There are four fold-down stabilisers underneath and a swing-down jockey wheel. The entire unit can be assembled from a standing start in about an hour and you only need an electric screwdriver. The modular panels screw together easily and can be assembled in a number of configurations. The rear doors are merely fitted to removable hinges and have a centre lock. They aren’t dustproof, and neither is the whole unit as the trailer tray is used as the floor. You may well get some water ingress from the floor in a deluge but I didn’t get to test it — thankfully. The modules are fixed tight with a ratchet strap and held firmly to the trailer via six turnbuckles and chains for the 10ft model, and four for the 8ft variation. The internal dimensions of the Tail Feather in the 10ft configuration as viewed are 2960 x 1630mm. 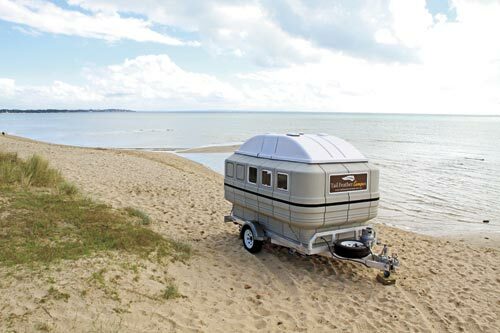 It feels spacious and the overall head height of 188cm really adds to the non-claustrophobic and uncluttered simplicity. 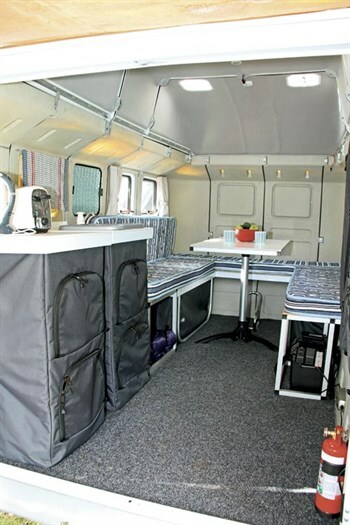 The standard unit has a modular dinette that drops to form a “double” bed, but it runs east-west across the camper and hence is only suitable for shorties. 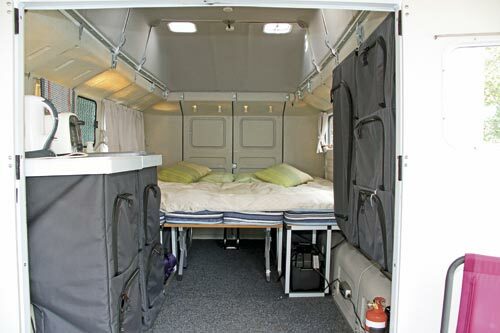 The problem was fixed by adding a pair of seat extensions with a drop-in insert that makes the bed enormous by running north-south and full width, and it gives more seating space and storage. As you walk in the rear barn doors there is a very simple “kitchen”, which is really just a shelving unit with a polypropylene top and a cut-out for a portable plastic dish bucket. It has its own removable 20L water bottle and a manual pump-up tap. The kitchen has soft sides and front with zips to retain pots, pans, utensils and pantry items. On the opposite side is a soft wardrobe for clothes. 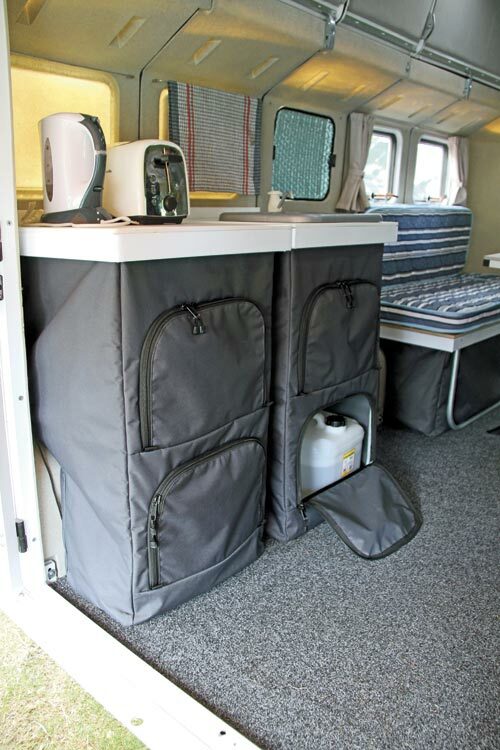 The Tail Feather is a terrific base as it stands, however we can see plenty of people taking the modular base unit and converting to their own individual requirements. The modular panels can even be flat packed for delivery across the country. 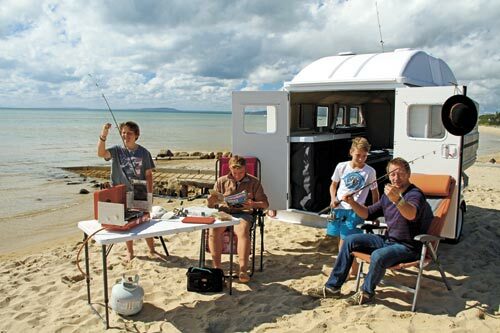 The aluminium trailer and indestructible nature of the plastic modules mean that it is a lifelong investment. 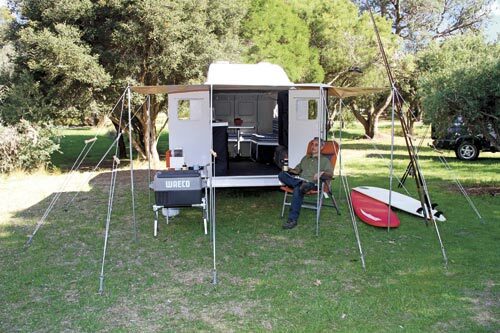 This review appeared in issue #77 of Camper Trailer Australia magazine, June 2014. 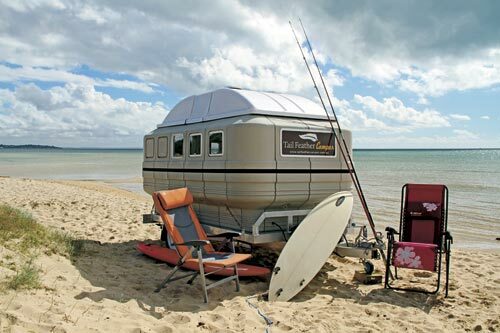 Why not subscribe today for all the latest camper trailer news, reviews and travel inspiration.